Urgh - still the same. I haven't exercised for one whole week. It was exactly a week ago that my knee went whilst running. So, I have decided to rest it. I did, however, do a small bike ride with the kids on Sunday so not exactly no exercise. Speaking of which the Tour De France is back on!! I tell anyone who will listen to watch it. Even my parcel guy he joked today that I'd be on his case if I don't watch it. Its such a fabulous sporting event. Another item to be added to my bucket list is to follow the tour from start to finish. My husband says he'll be dead by the time that will happen i.e when the kids are old enough to be left/take with us without disrupting their schooling. In fact, he made a valid point in that "why is it you can only do the things you want to do when you're dying?!" True though isn't it. If you were given X amount of days left to live you'd dig out and dust down that bucket list and start ticking. Having said this, there's not much more on my bucket list - my greatest pleasures are the small moments - the hazy days lounging around in the garden mucking around playing table tennis and the like. Not to mention the sense of self satisfaction I get from printing off my family photos and finally getting around to put them in their allocated albums. Told you its the simple things in life for me! 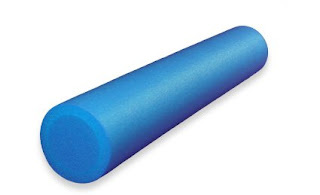 Anyhow, back to my 'injury' - having met up with my friend Tash who I only get to see once a year what with her living in Hong Kong and all - she insisted I get a foam roller. She said its worked wonders for her back and by all accounts its great for stretching out your calf muscles and the notorious IT band. I'll give it a whirl this evening. 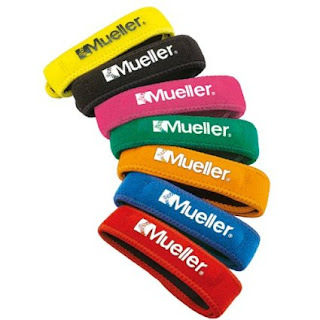 In addition I bought a little strap that by all accounts, with the reviews on Amazon, does wonders for 'runners knee'. Expect a miraculous recovery tomorrow. I'm going to try a little run after drop off. In addition, my son is back into his cycling and wants to practise on the nearby park so I will go out with him as he keeps pestering me that he needs to practise for a competition next week. As ever, the summer holidays - all 7 weeks of them - are a danger zone when it comes to weight loss. I can't wait for the kids to break up on Friday at 2pm. Its a bit bitter sweet as it'll be my eldest last day at primary. I think I may need some tissues during his final assembly. I am so proud of him. He adapted really well when I moved him to a different school and he passed his SATS with all 5's and a 6 in Maths. My daughter is also thriving and moves into Year 5 and little Buddy will be in Year 1. I'm quite excited by the whole Secondary stage - its totally new to me and a different chapter in our family unit. There's still lots going on at school - class parties, pool party, leavers disco, teachers card/presents, assembly, met the new teachers etc etc. I am sitting here just enjoying the last few hours of semi silence apart from the tapping of my keyboard and ITV4's commentary of the Tour De France. Right, off to log my fitness pal and plan my exercise for next week. I need to lose another stone preferably before September. I have a choice of two lovely dresses for my 6 year anniversary next week.